Woodridge Bed and Breakfast Slidell Louisiana - Shootin' the Breeze: 2016 - Changes for the better YOU. 2016 - Changes for the better YOU. The new year is upon us and we all make promises to make the new year a better one. Exercise more, eat healthier, change your carrier... well you know the drill. But how has that worked for you in the past? Are your goals ones that you can live with because that is eccentrically what you are promising yourself. How about in 2016 have a goal that IS good for you, a goal that is good for your health - mind, body and soul. It is called a VACATION, yes a vacation. Time away from your daily life. Time to relax, refresh, renew with no stress. Are you one of the 15% who don't take time off? Start 2016 with a change, Take a break. There is so much in this wide world to see. OR plan a close by getaway, kick back with a good book. Nature is a great distressing tool and the Northshore of New Orleans is perfect with Woodridge Bed and Breakfast in the heart of it all. Give us a call, we will be happy to help you with those nature hikes. 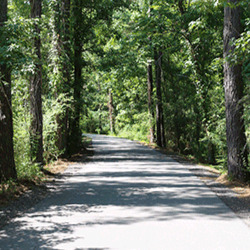 Bring the bikes and ride the St. Tammany Trace.